Flood warnings in place for Wyandotte County; homes not expected to be in any danger – Welcome to Wyandotte Daily! 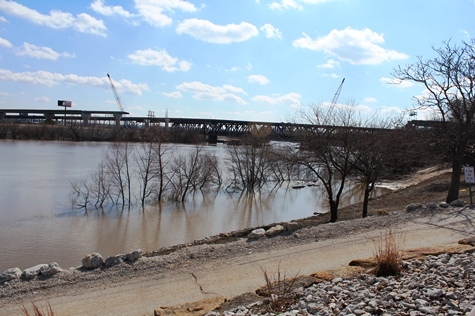 While flood warnings have been issued for the Missouri River at Kansas City, residences in Wyandotte County are not expected to be in danger, according to Wyandotte County Emergency Management Director Matt May. May has been very busy the past few days with flood monitoring and preparations. With the current forecasts, there has not been a need to deploy any sandbags here, May said. At this time, Wyandotte County residences are not in any danger, he said. Extensive flooding and loss of homes has taken place upstream in Nebraska with this flood. Significant flooding has been reported at St. Joseph, Missouri, Atchison, Kansas, and Leavenworth, Kansas. Wyandotte County is under a flood warning for the Missouri River above Parkville, Missouri, currently in moderate flood stage, which for Wyandotte County means that the Wolcott levees are at risk of being overtopped, according to the National Weather Service hydrology charts. The river at that point is scheduled to crest on Friday, according to the weather service. Businesses on Wolcott Road in Kansas City, Kansas, including Lakeside Speedway and a cement company, could be affected. May said the new river gauge at Parkville really is in the middle of I-435 over the Missouri River, between Wyandotte and Platte counties. An electronic device takes a reading off the surface of the river. “Because it’s so close to our area of concern, it’s very predictive of what’s going to happen to us,” May said. The flood stages are based not only on how high the river is, but also on the potential for impact, May said. One of the differences between moderate and minor flood stages is if there are structures in the path of the flooding, he said. If Lakeside Speedway and the cement company had not been located near the river, the river stage probably would have been minor. Also, he said the differences between the minor and moderate flood stages are not the same at every place. Flooding levels can be different at different places on the river. 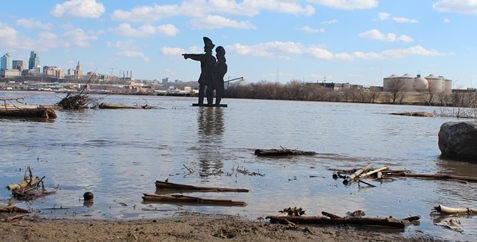 Wyandotte County has been placed under a minor flood warning for Friday and Saturday for the Missouri River at Kansas City, which is located south of the downtown airport in Kansas City, Missouri, close to the City Market, east of Kansas City, Kansas, and the state line, and not far from Kaw Point. 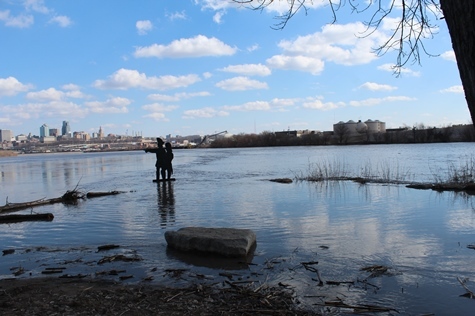 On Tuesday, Wyandotte County was placed under a minor flood warning for Friday for the Kansas River at 23rd Street, a location that is at Kansas Avenue and the state line. That location is in the Armourdale area on the Kansas side, and near the American Royal on the Missouri side. Under the minor flood warnings, no homes would be affected, May said. Two other gauges in Wyandotte County, the Kansas River over the Turner Bridge, and Turkey Creek at Southwest Boulevard, are well below flooding. 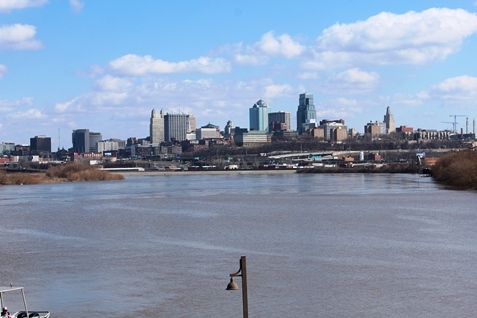 May said he anticipated seeing a higher water level where the Missouri and Kansas rivers come together at Kaw Point in Kansas City, Kansas. He added they are keeping a watch on any backwash from the Missouri River into the Kansas River. While they are watching the Kansas River, it is not a cause for concern at this time, he said. This has been an unusual flooding event, May said, because predicting it is difficult. The predictions were difficult because the water is not coming from rainfalls here, but from runoff in the Dakotas, he said. Even if it rains hard here, it would have little effect on the flooding, he said. The snowpack melting in the north, the water releases from the upstream reservoirs and levees failing to the north have had an effect on predicting the flooding, he said. When levees upstream failed, that relieved the pressure and water spread out into the fields, he said. Then not as much water traveled as fast to the Kansas City area. But there was a rebound effect, and once a flooded area fills, it bounces back, he said. Water releases were increased March 14 and 15 from reservoirs upstream, then they were gradually reduced. Originally it was thought the river would crest here on Tuesday, but the crest changed to Friday, as levees failed upstream. May said he has learned not to take the forecast predictions too much for granted unless they are within a 48-hour period. Increased flows are being seen downstream of Rulo, Nebraska, according to Corps of Engineers officials at a news conference Wednesday. According to Corps of Engineers officials, a lot of flood preparations and sandbagging currently are taking place in Doniphan County, Kansas, Buchanan and Holt counties, Missouri. St. Joseph, Missouri, is currently in major flood stage and Atchison, Kansas, is projected to go into major flood stage. So far, more than 470,000 sandbags have been issued, with 3.6 million available, according to officials. 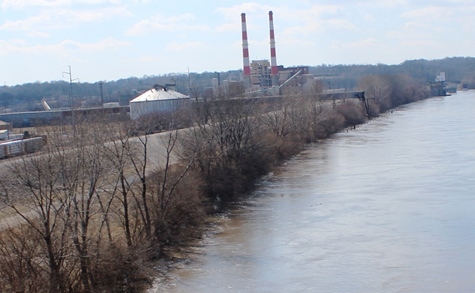 A levee was breached this morning at Craig, Missouri, and the city was evacuated, according to a Corps of Engineers official. Corps of Engineers officials said many of the cities to the north and south of Kansas City on the Missouri River are currently flooding. Kansas River reservoir water releases have been reduced to a minimum, according to officials. Parts of the Missouri River upstream are now closed to use. 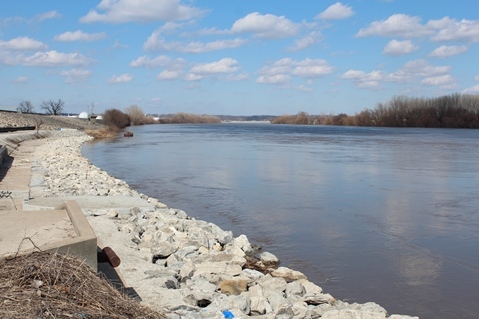 Water releases upstream on the Missouri River also continued to be reduced from the reservoirs, and the Gavins Point dam releases were planned to be down to 20,000 cubic feet per second on Thursday, officials said.